Chickens lay eggs. Sometimes drop feather. You can throw eggs. That's it. SO BOOORING! Minecraft is a magical place so why not to add a little bit of magic? Chicken laying gunpowder... bonemeal... snowballs... YEAH! And what if you try to crossbreed them? Iron? Gold? DIAMODS? Just try it! - dye chickens, combine an ordinary egg with a dye and throw what you get to obtain a chicken laying dye: Lapis Lazuli Chicken, Cactus Green Chicken, Rose Red Chicken, Bone Meal Chicken... you can breed them for gray, pink, etc. - get higher tier chickens by crossbreeding them and have Diamond Chicken, Ghast Tear Chicken and many many more! - lava and water eggs: get your renewable and stackable liquid source today! And let me know what do you think! I bred a Full Lvl. 10 Flint Chicken with a full lv. 10 BoneWhite Chicken but only get Lvl.1 Iron Chicken eggs. I heard that if i breed 2 max level Chicken i'll get the lvl 10 egg to if i breed dem? That was in really old versions that happened in. That is no longer the case. That was never intended.. and got changed a long time ago. TY, glad your enjoying the mods. Hello, I'm on 1.12.2, and the vanilla recipes and Pam's recipes involving eggs do not work with the modded eggs. The JEI says that I can use those eggs in the recipe, but when I move the items into the grid using the plus button (auto-pulls the items from inventory so I'm sure it's pulling the right ones), or move them there myself, the output is not available. Any idea why? Yeah its already been reported, I just haven't had the time to get this issue fixed. I not sure why JEI says it, when it cant. but its a recipe issue. How can i see their stats without chicken analzer? You need to get a mod like HWYLA and go into the chickens config and change it so you can view chicken stats without having to have the analyzer. In previous versions of this mod, breeding a 1 1 1 chicken with a 10 10 10 chicken would produce eggs of 9 9 9. With this version, when I breed (for example) a 1 1 1 bone white chicken with a 10 10 10 Log chicken, I get 1 1 1 bone white chicken eggs and 10 10 10 log chicken eggs. How can I get the mod to produce the 9 9 9 eggs again? Example: flint+bonewhite should create iron, but i only get iron chicken when almost none other mods are installed. if i enable betterfps or optifine HD_U_D2 (HD_U_D3 works fine), or some others, new chicken will be the same as one of parents (so, either bonewhite or flint). Am i missing something important or is this a bug? Another question - how to summon chicken using console? "/summon chickens:ironchicken" result is "unable to summon object"
seems like there was an important thing i missed: breeding is random? so flint+white = sometimes white, sometimes flint and only occasionaly iron? Because normally mod pack developers change recipes from the default ones. Use NEI to find recipes for items. At default, sand chickens, flint chickens, bone white chickens, and log chickens spawn randomly in the world in various biomes. If you look in JEI and see no recipes for those types of chickens, that's because the modpack author didn't include any and you will have to go explore and find some. Bring along a few animal nets! Thank you for your work on this mod, it's one of my favourites. 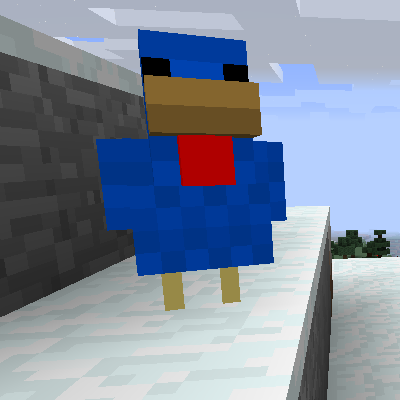 If only Chococraft was still being worked on, I could create a Supreme Bird Empire. I was wondering, if I wanted to up the spawn rate, I assume its the "Spawn probability" in the config? You would be correct. you will have to play with the numbers, as it effects all spawn-able creatures. find what works best for you. Hello! I'm trying to use villagers to trade spawns eggs of the chickens for emeralds but I just cant get the spawn eggs down correctly. How would I go about adding your chickens to the spawn egg?